Just Between Friends is seeking energetic, motivated bargain lovers who are dedicated to serving their families and communities. We are committed to our company's core concept of bringing high quality sales events to help families shop, sell and save across the nation. On Demand Buying - Now you can sell ANYTIME to make room and money. 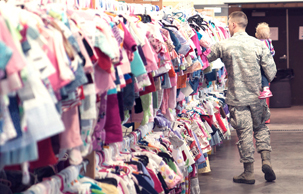 JBF buy your top-notch children's items at garage sale prices and pay on the spot! In addition to being tons of fun, there are lots of great "perks" involved with being a part of the JBF Team. Volunteers typically earn a higher percentange on their sold items and invitation to the presale. The crew can help with everything from event set up, inspection, organizing merchandise, running the point of sale system and breaking down the event. The more shifts completed, the earlier the shop time! The earlier the shop time, the more merchandise and bargains to be had! Consignors drop off their items during a designated time the week of the sale. Consignors have the option to pick up their unsold items after the sale is over or can donate them to the local charty partners. Before you start entering your clothing items, please inspect them being sure you are following the JBF guidelines for quality. Do not sell any items that have stains, tears, holes, rips, are too worn, or out of season. The $3 minimim pricing rule does not apply at all of our locations. Please contact the local owner to confirm. We encourage you to price your items competitively and use the pricing guide below as a resource. Nursing covers & pillows, feeding items, monitors, safety items, diapering & toileting items, rattles, and more. We are only able to accept Free Style breast pumps. Pump accessories are okay to sell. Check for safety recalls on all items that you consign. • CONSIGNORS sell their items to earn money and they get to shop early. 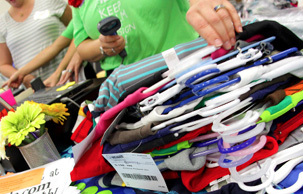 • VOLUNTEERS earn more on the items they sell and they shop extra early! 1. Teachers - Teachers of day cares and preschools, elementary schools, homeschoolers! 2. Adoptive and Foster Families! 4. Expectant and 1st-time Parents and Grandparents!